AURORA, Ill. (February 10, 2015)- Arlington, Texas'' AT&T Stadium will play host to the seventh stop of the 2015 Monster Energy AMA Supercross, an FIM World Championship, this Saturday night as 450SX Class points leader Red Bull KTM''s Ryan Dungey aims to protect his nine-point lead against the most competitive field of riders ever assembled. The Eastern Regional 250SX Class Championship begins on Saturday with defending champion Justin Bogle, who rides for GEICO Honda, ready to stage his title defense against a hungry field of aspiring young riders. Additionally, HRT Racing Suzuki''s Vicki Golden sets her sights on becoming the first female ever to qualify for a Monster Energy Supercross Main Event. Saturday night''s race will air live on FOX Sports 2 at 8:00 p.m. EST/ 5:00 p.m. PST. Live coverage from Arlington will also be available on the authenticated FOX Sports Go app. Media Day will take place Thursday, February 12, at 12 Noon CST at AT&T Stadium, featuring HRT Racing Suzuki team''s Vicki Golden, Pro Circuit Kawasaki''s Joey Savatgy and Arnaud Tonus, as well as Yamalube/Star Racing Yamaha''s Anthony Rodriquez and Jeremy Martin. •	Vicki Golden attempts to become the first woman in history to qualify for a Monster Energy Supercross race. •	Will Ryan Dungey extend his podium streak, which now sits at five races? •	Can Dungey or Eli Tomac join Trey Canard and Ken Roczen as two-time race winners in 2015? •	Will a fifth different rider emerge victorious in the 450SX Class? •	Can two-time 450SX Class Champion Chad Reed score his first win of the season? •	Will one of the 450SX Class rookies - Jason Anderson, Blake Baggett and Cole Seely - break through for his first career win? •	Dungey and Anderson are the only 450SX Class riders to finish in the top-10 at every race. Can they keep their streaks alive? •	Will Tomac earn his sixth-straight top-five finish? •	Which Eastern Regional 250SX Class rider will make the first statement towards the championship by winning in Arlington? •	Can Justin Bogle start his title defense with a win? 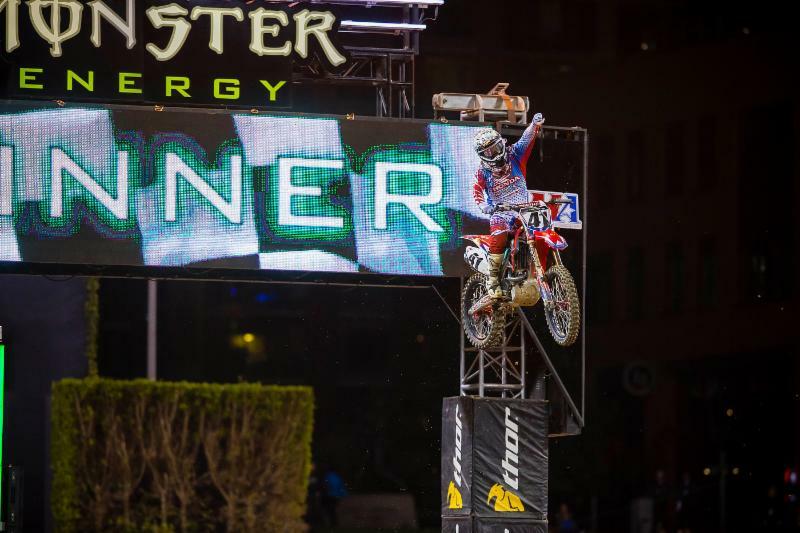 Last Saturday at the Military Appreciation Race from San Diego''s Petco Park, Team Honda HRC''s Trey Canard raced to his second 450SX Class win of the season. As a result of his second win in three races, Canard took sole possession of third place in season standings. Canard took over the lead from RCH Soaring Eagle/Jimmy John''s Factory Suzuki''s Ken Roczen on Lap 3 and rode the early stages of the Main Event with a comfortable lead over Roczen until lappers tightened the race for the lead. Roczen, who also has two wins on the season, made a run at Canard following the halfway point of the race but was denied and settled for second place. Prior to the 2015 season, Canard''s last 450SX Class victory came inside AT&T Stadium in 2011, during his rookie season. "It''s been a long road but I''m just so grateful to be in this position [winning races] again," said Canard of his fifth career win. "I opened a gap and Kenny [Roczen] closed it right back in. He kept me on my toes the whole time." Roczen was the 450SX Class points leader until a crash and subsequent 15th-place finish in Oakland caused him to lose control of the points. His finish in San Diego was his best since the incident. "That was a very fun race, I just made too many mistakes," said Roczen on the podium. "It was a good battle [with Canard]. I wish I would have picked up the pace sooner, but it''s good to be back on the box. It was a good night tonight and we''ll keep charging." Dungey, who has an average finish of 2.5 this season, including a win at the third race in Anaheim, rounded out the podium in third place. He finished second in Arlington a year ago, has one win at AT&T Stadium from 2010 and has finished on the podium in four of his five starts. 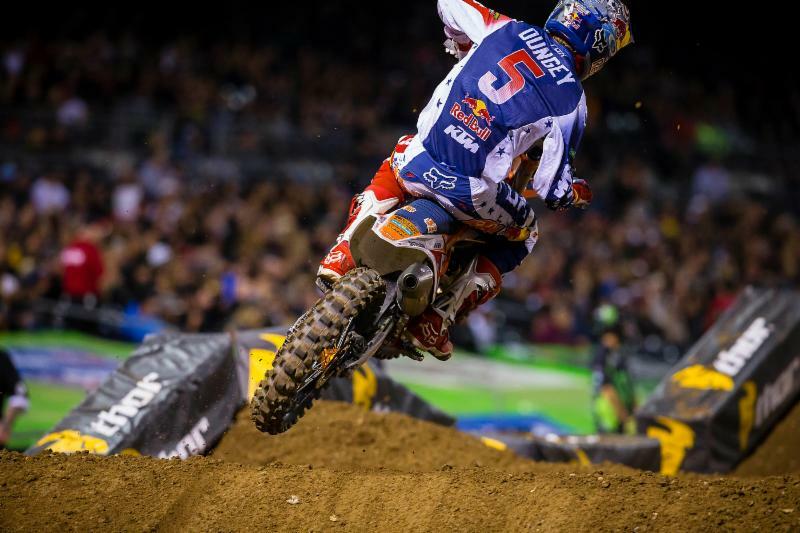 "I felt good in the Main Event," said Dungey following San Diego. "I was hoping I''d be able to close in on the leaders, but those lappers were tough. We gave it our all and we''re happy with that. We''ll keep working and get ready for next week." 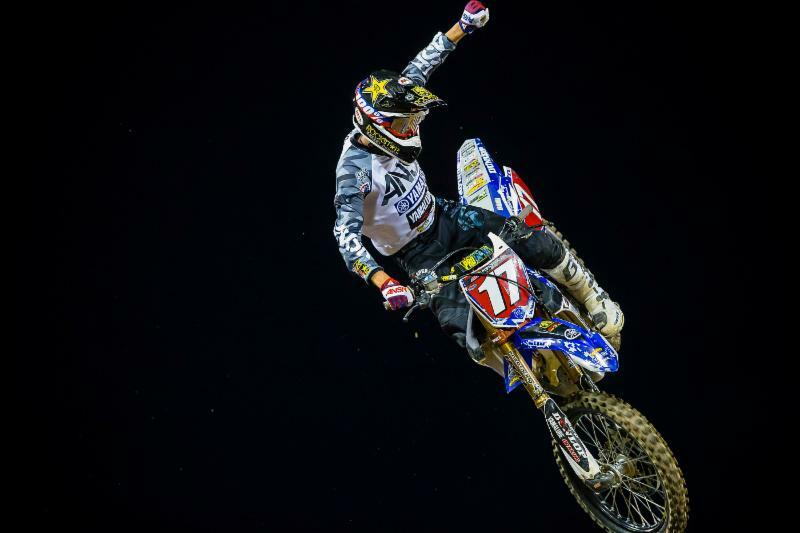 In the final Western Regional 250SX Class race before that championship''s midseason break, Yamalube/Star Racing Yamaha''s Cooper Webb made a statement in San Diego, scoring his fourth win of the season. During practice, Webb suffered a horrific crash, and with his status questionable, he made his way to the starting gate, despite missing the final practice session. He will carry a 30-point lead in point standings when the championship resumes in Houston on April 11. Webb followed rival Tyler Bowers, a four-time AMSOIL Arenacross Champion and Monster Energy/Pro Circuit/Kawasaki rider, until he made what would be the winning pass for the lead on Lap 9. "I wasn''t going to race tonight," explained Webb after the race. "My crash was gnarly and I''m just thankful to walk away from it. I knew tonight was going to be a fight. I told myself I can hurt as much as I want tomorrow, but there''s no better feeling than winning." Troy Lee Designs/Lucas Oil/Red Bull/KTM''s Shane McElrath earned a career-best second place finish, his first career podium, with Bowers in third. Vicki Golden''s journey to Monster Energy Supercross will commence this weekend with her debut race for the HRT Racing Suzuki team. Golden first made history back in 2011, when she became the first female to qualify for an AMSOIL Arenacross Main Event. Last year Golden made even more history when she earned her 250SX Class endorsement through AMSOIL Arenacross'' Ricky Carmichael Road to Supercross, giving her the chance to chase her supercross dream. In a stacked field of Eastern Regional 250SX Class riders, Bogle''s stiffest competition is expected to come from a pair of international riders in Red Bull KTM''s Marvin Musquin and Rockstar Energy Husqvarna Factory Racing''s Martin Davalos, as well as Yamalube/Star Racing Yamaha''s Jeremy Martin. Musquin returns to supercross racing after missing the 2014 season with an injury, but the French rider has a strong foundation to build on. The runner-up in the 2013 Eastern Regional 250SX Class Championship is also a two-time MX2 World Champion and has four Main Event wins. Ecuador''s Davalos has showed flashes of brilliance in recent years, but injuries have set him back. Last year, he finished second overall in the Eastern Regional 250SX Class Championship in a season that was cut short due to an injury. Aboard a new team, Davalos is ready for a fresh start and the number-one plate. Martin endured an up and down season during his sophomore campaign a year ago, but he came on strong at the end of the year, capping off the 2014 supercross season with his first career win at the season finale in Las Vegas. He carried that into a breakout summer season in the AMA Pro Motocross Championship, winning the first title of his professional career. Confidence is high for the Minnesota native and he''s confident he can be a title contender. Headlining the Road to Supercross graduates in the 250SX Class field as rookies is the GEICO Honda tandem of Jordon Smith and R.J. Hampshire, who will line up alongside Bogle. Smith is looking to become the first rider in history to complete the Road to Supercross and make his 250SX Class debut in the same season. Smith suffered an injury prior to the start of the 2014 season and was forced to miss the entirety of AMSOIL Arenacross . As a result, he began 2015 competing in the Road to Supercross in the weeks leading up to the Eastern Regional 250SX Class Championship. However, Smith revealed this past weekend that he broke his hand in preparation for his Arlington debut and had a plate and six screws surgically placed. Despite the injury, Smith has every intention of racing on Saturday..
Hampshire enjoyed success during his time in the Road to Supercross, winning a pair of Arenacross Lites Class Main Events in addition to one Arenacross Class Main Event. As one of the up-and-coming members of the GEICO Honda squad, Hampshire has the talent to contend for podiums in the 250SX Class in 2015. 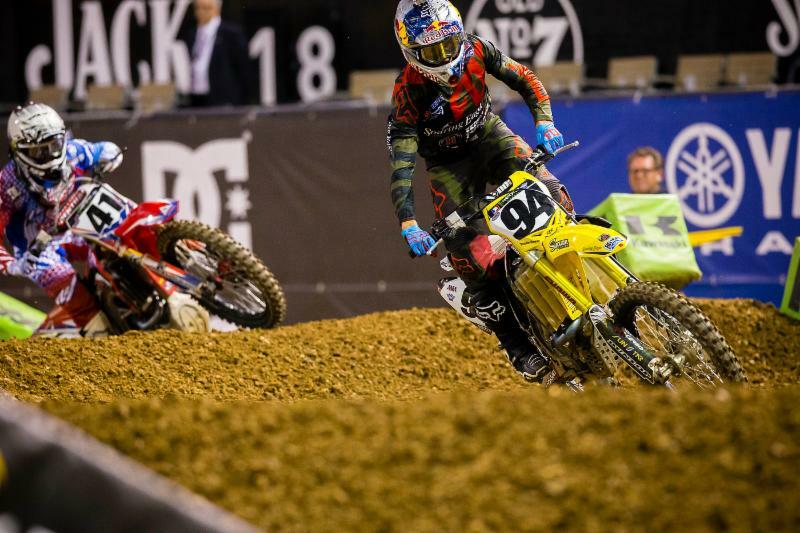 During last year''s 450SX Class Main Event in Arlington, Team Yoshimura Suzuki''s James Stewart won his second consecutive race in Arlington. In the Western Regional 250SX Class, Monster Energy/Pro Circuit/Kawasaki''s Adam Cianciarulo won his first race in the first supercross start of his career. Tickets are available at the AT&T Stadium Box Office, all Ticketmaster outlets, charge by phone (800) 745-3000, or online at www.SupercrossLive.com or www.ticketmaster.com. Practice and qualifying begin at 12:30 p.m. and the Main Event starts at 6:30 p.m. Club Seating is $65 Adult/$32.50 Child; Lower Level $50 Adult/$25 Child; Upper Level $40 Adult/ $20 Child; Endzone Lower Level $45 Adult/$22.50 Child. Fans can also get in to the Pits for FREE from 12:30-6 p.m. Race Day when they recycle a MONSTER Energy Can at the stadium''s pit entrance (valid only with event ticket). Headlining the 2015 Monster Energy Supercross television package will be the first-ever live FOX network broadcast from MetLife Stadium in East Rutherford, N.J., on Saturday, April 25 at 3 p.m. EST. FOX Sports 1 will broadcast 12 races live and FOX Sports 2 will broadcast 3 races live. Each race will include a next-day re-air on FOX Sports 1. In addition, the authenticated FOX Sports Go app will live stream each race. As a precursor to the live television, don''t forget to catch all of the pre-race coverage with Supercross Race Day Live, which will stream on SupercrossLive.com from 12:50 p.m.- 4:30 p.m. local race time each Saturday during the season. Practice, qualifying, behind the scenes features, and key rider interviews will all be highlighted on the Supercross Race Day Live webcast.